A paper plate is a good staple to have on-hand for lots of projects, particularly this one! White paper plates with the bumpy edges are available at most dollar stores or discount stores, and they make. the. perfect. skull. Day of the Dead is a chance to honor loved ones who have passed away. It's full of color, flowers, designs, butterflies, and other beautiful things. I used the die cut shape maker in the teacher's lounge to cut out mini flowers, butterflies, and stars. You can use foam or other stickers, small pieces of leftover paper, or even glitter glue to decorate these skulls. Various colorful shapes, stickers, ribbons, tissue paper flowers, glitter, etc. etc. Cut the paper plate (be sure there's only 1) into the shape of a skull. Save about 1- 1/2" to 2" of the outer ribbed area for the teeth. Cut the rest of the ribbed part off and keep the skull nice and round. Using markers, draw two large eyes with flower petals going around each one. Draw an upside-down heart for the nose and add lots of swirls, gems, dots, and designs on the face. Glue additional flowers, butterflies, etc. for the crown if desired. 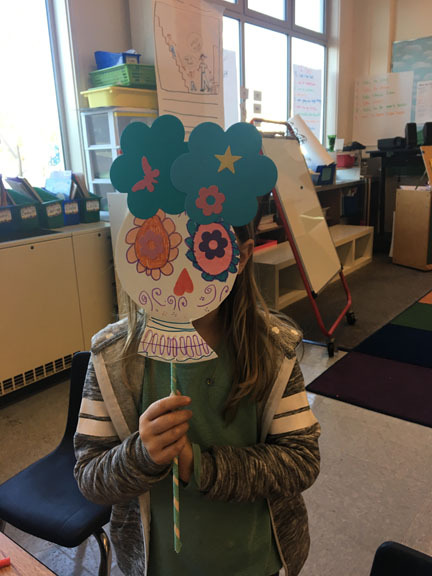 Secure the calavera onto the stick using masking tape or painter's tape. Tips for drawing on the face: Start with the eyes, as they are the largest and most important part of the calavera. You can keep the inner circle small to allow lots of room for colorful flower petals. This part is what makes the skull essentially a calavera. Create swirls around the cheeks, going up. Add dots between swirls and petals, in a line along the chin, and on the forehead. Traditional colors include magenta, aqua, orange/marigold, yellow, bright green, purple.